A transcript of the Lew Rockwell Show episode 375 with Russ Baker. 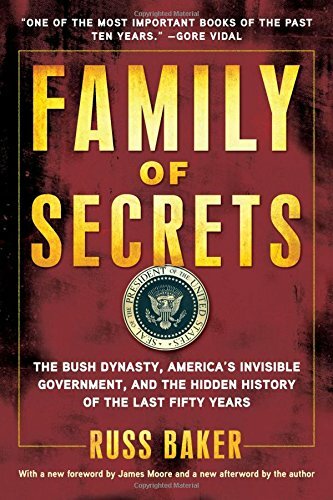 The Bush Dynasty, the Powerful Forces that Put It in the White House and What Their Influence Means for America, and an updated paperback under the title of Family of Secrets: The Bush Dynasty, America’s Invisible Government and the Hidden History of the Last Fifty Years. Russ has his own site, of course, RussBaker.com, also WhoWhatWhy.com, which continues his investigative reporting outside of the mainstream media. BAKER: Yeah, there’s a long history of that. Throughout my journalism career, I’ve seen repeatedly how attempts to prevent the public or it’s representatives in the press from obtaining information has turned out to be, as you say, to basically protect themselves. Almost never do I see evidence that this would have actually damaged national security. And, of course, the term “national security” itself is rarely examined as to what it means and so we just take all of this stuff for granted. Now, in the Boston bombing story, as you know, I devote most of my time; but I’m not writing books like Family of Secrets. I devote almost all of my time to WhoWhatWhy.com, also WhoWhatWhy.org. We’re a non-profit investigative news site. And as you know, Lew, I started that some years ago because I felt like we weren’t getting the story from the corporate media, but we also weren’t getting the story from the so-called alternative media, which seemed to operate with such an agenda that you could kind of always predict where the stories are going to come down. One of our readers said, “My god, you’re talking about a pure journalism play.” In other words, we are not going into these stories trying to persuade you that we know everything, that our viewpoint is right. We’re actually interested in information. And so we’re really interested in knowing what happened at the Boston bombing. It’s not that we believe that the authorities are telling the truth or that they’re not telling the truth. We are looking at the actual facts of the case. And in the information that has come out, we’re seeing tremendous anomalies, inconsistencies, out-right falsehoods, reversals by these agencies, and we are troubled by them. And we think that that’s all the basis for reporting. And so I and other members of our team have been working this story now for more than a month, and we’re going to stay at it for a few more months. We’re hoping that the public will support us so we’re able to cover the costs for doing this. As a non-profit, that’s very important to us. But nevertheless, we’re going to continue looking at these things. Certainly, what you’re talking about with the information clamp down, this is very, very disturbing because we’ve seen all kinds of clamp downs. We saw the clamp down on the freedom of movement. We’ve seen the increasing encroachment of military troops into our American cities. We see the public getting softened up and being made to become more and more comfortable with living in kind of a military state almost. And I think that that’s one of the larger themes of many, many themes that need to be addressed in investigating the Boston bombing. BAKER: Well, that’s right. I spent the last two weeks there. I’ll be going back again. I can’t stay there full time. I’m based in New York now, not in Boston. But I did spend two weeks there, and it was very, very instructive and I got a sense of a bunch of things. I met with and even drove around with journalists from major newspapers and radio shows; some good people, but I could see the limitations. There really is almost nobody there digging deeply into these problematical issues. And when I say problematical issues, what I mean is it is the job of the media to just find out what happened. It is not our job to pass along what somebody else says happened. That’s not our job. And the media there, the major newspapers, the TV and the radio, by and large, just said what the authorities told them. In a few cases, places like “The Boston Globe,” they do more than that, a little bit more than that; they’ve tried to talk to people. But I can tell you from my own experience that a lot of this stuff is being controlled. And what’s very interesting was, if you go into that article and you read all the detail of what I investigated — and we’ll be doing more on this — first of all, when Officer Collier was killed, we were essentially told either explicitly or implicitly that he had been killed by these two brothers. Now what’s very interesting is, at the time that he was killed, all we knew was that these two brothers, whose names were not even public yet, were pictures out a video, wearing backpacks, walking along with dozens, hundreds of other people wearing backpacks and walking. And so it was the death of this police officer that set everything into motion. BAKER: Well, in the dark, but this guy was basically gravely injured. BAKER: According to the story, which is a little bit strange, of the man who owned that boat, when he went out to check, I mean, he saw blood there. I mean, this guy was already in a pool of blood before they called the cops. Because we know he’s gravely injured in the hospital. So the likelihood that he was in any shape, you know, to sort of heroically prop himself up and go to these incredible lengths to scrawl out a confession virtually with his dying breath is a little bit hard to believe. And so I have to agree with you. I mean, in some respect, of course, one wants an agency like the FBI to be there, but that doesn’t mean we have to apologize for the grave structural, philosophical and other problems with it. The FBI, the CIA, the Secret Service, local police, all of these institutions are absolutely riddled with problems. And, you know, my attitude as a journalist is many institutions are riddled with problems, many aspects of the federal government, but also private industry, big corporations, riddled with problems, abuses and so forth. And it is not our job as journalists, and I don’t think it’s our jobs as citizens, to just accept what anybody tells us and to just blindly trust when they say, whether it’s the FBI or it’s your bank, “Hey, we care about you.” Baloney! I mean, they’re in business for themselves. ROCKWELL: Well, I would say this goes back in some sense to the New Deal, but America was a corporatist system, what Mussolini would have called a Fascist system, a combination of big government and big business against the rest of us. And so, yeah, there are plenty of problems. But I must say I’m always struck by the subservience of the American people, with the exception of a few of us. And maybe it’s just my imagination. Maybe people are actually boiling with upset and dissidence against what’s going on. But it seems like, whether in my former territory of Boston or other places, people seem to accept this militarism and really what was a temporary totalitarian state in Boston, even the ridiculous notion of soldiers going around in desert camouflage in Boston. What is the point of that except, of course, for militaristic propaganda? BAKER: That’s right. And it’s also to sort of get people used to these ideas. I think it’s important to understand that not everybody shares the same benign notion about the rest of us. You know, when I go out and I walk down the street, I try to feel, even if I’m in a bad mood, positively disposed. And I look out and I say, “These are my people,” I mean, whoever it is walking down the sidewalk, whether they’re black or they’re white or they’re rich or they’re poor. And that really is supposed to be the spirit of this country. They tell us all the time we’re in this together. That’s why we have these big things at stadiums that the sports are about and everything else, is to make us feel like we’re part of something, to be committed to this kind of togetherness. But unfortunately, not everybody shares that. And the truth of the matter is that if you talk to a lot of people in the military and plenty of people in the police privately, they will tell you that they don’t like democracy. They don’t like the majority making decisions. They’re not happy with that. They are worried about who is going to attain power. And if you are a big industrialist or banker or something else, your primary concerns are not increasing freedom of speech and increasing the democracy and transparency, because those don’t serve you. If you’re already at the top — this is why these kinds of people tend to have what you were referring to, sort of Fascistic inclinations, because really what they want is that kind of corporative situation where the organs of power are primarily there to defend their enterprise, to go in and bust up the efforts by workers to organize, to try to stop consumer advocates or anyone who wants to look into conditions or circumstance or the quality of the products or the services that they’re purveying. I know that you and I differ somewhat on some of these issues, but I think that we agree on the notion that the principles of democracy and freedom and speech are important ones and that there are a lot of people who aren’t for that. And unfortunately, because of the influence of money in our society, those people dominate things. They can influence who gets elected president. And then the president chooses the attorney general, has a kind of say in who becomes the FBI director, and even more importantly, who are those career people at the FBI or at the Justice Department who are in there for the long haul. And when they leave, finally, they take very, very wealthy jobs, of course, in the corporate world. And so they understood all along who it was that they needed to be pleasing. ROCKWELL: Yeah. Of course, I must say, my own position is the president is just sort of a smiley face on the lapel of the oligarchy. I mean, he represents a huge, huge business and state Military Industrial Complex, Security Industrial Complex, interests. He’s not really an independent actor. If he were an independent actor, they’d kill him, like Kennedy. Speaking of Kennedy, before I talk to you about the very, very important book that you’re working on now, tell us what happened in the alleged fire or bomb or whatever the heck it was at the Kennedy Presidential Library in Boston. — the media dropped it. There were no more stories. Go and Google this thing, you’ll see zero, almost. I mean, nothing from the local Boston media or the national media. I mean, WhoWhatWhy is a little, tiny non-profit and we’re looking into it. And these giant news organizations have nobody asking these questions. ROCKWELL: Sort of the KGB line, right? Maybe you need to be put in a special hospital and injected with special drugs because you’re crazy to be a dissident. BAKER: Well, you know, Lew, there’s an incredible parallel about that. As you know, in my book, Family of Secrets — and you were talking about how presidents are puppets — Family of Secrets, which I spent five years on, is a pretty definitive investigation of, as Gore Vidal said, sort of a half of a century of a story that we don’t know about presidents and how they’re created and who’s behind them. And it’s all documented. It’s footnoted, you know, a thousand footnotes. ROCKWELL: It’s a great book, a great book. ROCKWELL: Of course, you’re exactly right. Many things go on here as well. And, Russ, before we go, I want you, to the extent you can, tell us about the book you’re working on now. ROCKWELL: You know, it’s interesting when you mention Roosevelt and Wall Street. I’ve always thought that it was an amazing thing that when you hear at least the mini biographies of FDR, of course, he was the governor and assistant naval secretary, president, and so forth. It was never mentioned that for a long time, he was a bond salesman on Wall Street. ROCKWELL: I mean, he was a key guy on Wall Street. ROCKWELL: So he came out of that milieu, of course, from the American aristocracy and so forth. BAKER: It only seems to be people from that class like him and like John F. Kennedy that dare take on their own people. ROCKWELL: Well, I appreciate very much, Russ, your coming on today, telling us about what you’re doing in Boston and otherwise, and can only cheer you on. As you say, we have some differences about the nature of the state and capitalism and so forth, but we certainly are agreed that this stuff, the bad things going on need to be exposed. There are so few people doing the exposing, and it’s great that you and your staff are doing so, and I can only wish you more success. And I can’t wait for your next book. BAKER: Well, thank you very much. I’ll take that as an incentive to get moving a little bit faster on it. ROCKWELL: Thank you, Russ. Bye-bye. BAKER: Thank you very much, Lew. Bye. ROCKWELL: Well, thanks so much for listening to the Lew Rockwell Show today. Take a look at all the podcasts. There have been hundreds of them. There’s a link on the LRC front page. Thank you.